It’s been a while since I last started a jamming session due to my busy schedule for the last couple of months. Never the less, there was a need once more hence I went and kick start it once again. Hopefully this time it will be more consistent as I will try to bring in help in the near future. Probably one of the greatest joy I’ve always get is to see the smile on the person face when they’ve finally managed to pick up a skill without them unknowingly knowing. 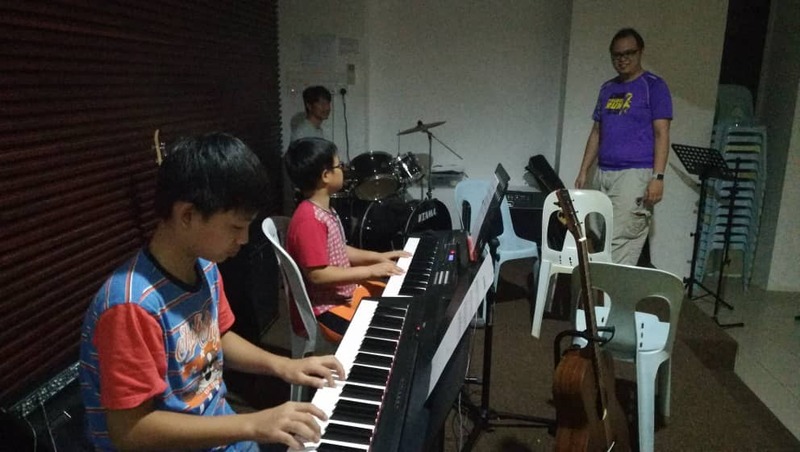 These kids, already had background in playing the piano, but when I started shifting them to different musical instruments that’s when the fun began. No doubt it was painful for them especially playing the guitar the first time, but hopefully it won’t be long before they will get used to it. Well, the key here is pretty much to get them to play together as a unit. But for the first time I think they did ok. I’m not limiting this training for kids but for those who really wish to learn as well. So the brother on the drums in the next video goes to show that you’re never too old to learn something new. Sure he still need to get use to his hands and feet coordination, but you can’t expect him to play professionally with just one practice. Teaching music is a fun thing, maybe it’s because my mentor who taught me years ago that music should be fun and not stressful. Especially those piano lesson I had years ago, where I eventually quit because I had problems reading the notes. So he taught me all he knew, and I’m pretty much handing down his knowledge to those who are willing to learn. Never the less, I seriously need to arrange my time properly and hopefully this will run on it’s own in a few months time.